The Ukrainian language is least represented on Inter TV. Almost 40% of all songs on the radio are in the Ukrainian language now, the head of the National Council for TV and Radio Broadcasting, Yuriy Artemenko, has said. He said at the presentation of the 2017 performance report at a meeting of the parliamentary committee for the freedom of speech and information policy. "The monitoring of radio companies showed an almost double increase in the share of broadcasting in Ukrainian, compared with 2015. Whereas before 2016, the share of Ukrainian songs on the air of network radio stations did not exceed 18% and they were mostly played at night, in 2017 this share reached 32% with songs in the state language being played throughout the day. It is important that since November 2017, this figure has gone even higher up and currently makes 39%. This is nearly 40%," Artemenko said. As for TV, the average factual share of the Ukrainian language reaches 86%, including bilingual shows. The Ukrainian language is least represented on Inter TV, 37%, Ukrayina, 66%, and ICTV, 74%. 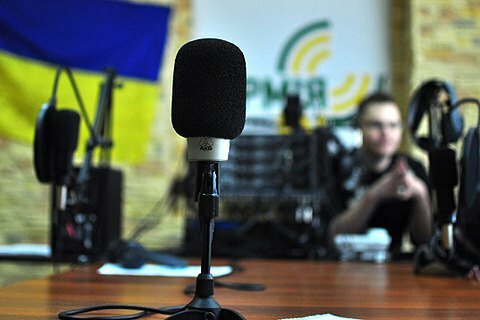 As of 7 November 2017, radio stations must have at least 30% of their broadcasts in Ukrainian. The quota will be raised to 35% in a while.